Carrie Fisher passed away on December 27, 2016 at the age of 60. Her death, just two weeks after the release of the latest Star Wars movie, was a major news event. What better time to sell a valuable piece of memorabilia like her old passport? One of Fisher’s old passports was posted for sale on eBay in January. 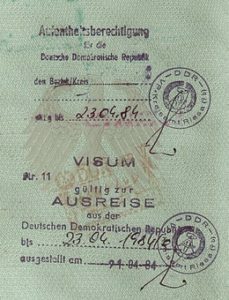 The passport, issued in May 1983, expired in May 1993. It’s marked cancelled, with a State Department notation that an application for a new passport was filed in July 1993. 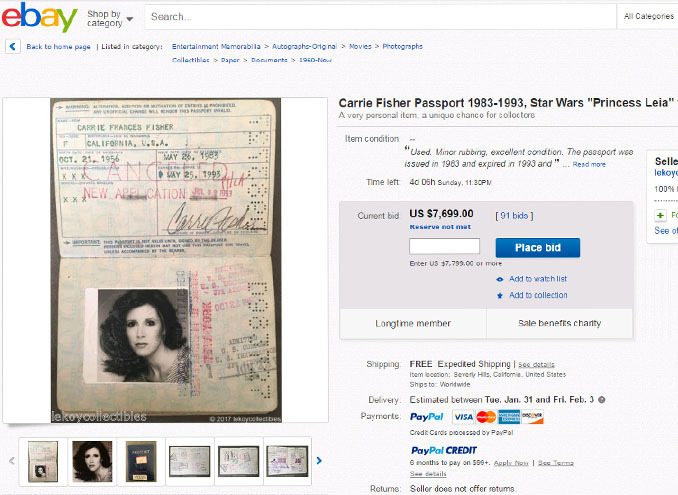 Bidding on Fisher’s old passport quickly escalated over $2,000, but eBay took the listing down on January 12. The website stated that the listing violated its personal information policy. Under this policy, eBay does not allow the sale of names, telephone number, Social Security Numbers, or other personally identifiable information. The policy is meant to prevent the sale of mailing lists for spam purposes. Who Really Owns Your Passport? If you think the answer to “who owns your passport?” is “I do,” think again! Technically, you are not the owner of your passport. You are the bearer of your passport, but it is actually owned by the US government. Don’t believe us? Look inside your passport and see! Is It Legal to Buy or Sell an Old Passport? Whether or not US law allows for the sale of old passports is a bit murky. For more insight on that subject, we turn to Tom Topol, a noted passport collector and historian. Mr. Topol is the most recognized expert in the field of passport history and collecting, and has been asked for his opinion on the sale of Carrie Fisher’s passport by numerous media outlets. He is not, however, the owner or seller of Fisher’s passport. What Makes a Passport Obsolete? An obsolete passport is one that cannot be used to obtain a new, valid passport. Your passport is valid for travel for ten years. You can use it for travel and all identification purposes starting on the day it is issued, until the expiration date printed on the information page. But your passport does not become obsolete on the day it expires! 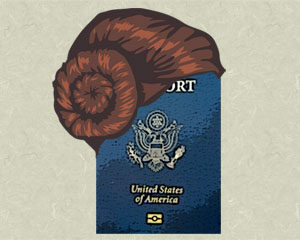 Your passport retains value as a proof of your US citizenship even after it expires. You can use your expired passport to apply for a passport renewal for up to five years after it has expired. It is absolutely, 100% illegal to sell a passport within 15 years of the date of issue! Anyone who gets hold of your recently expired passport could use it to apply for a new passport by mail, without having to submit any other supporting documents. Even when your passport has been expired for more than five years, it can still be used as proof of your citizenship. For instance, if you lose your valid passport, you can file for a lost passport replacement using that old passport as proof of citizenship. You might be wondering why anyone would want to collect old passports. As far as we can tell, there are two types of collector who would purchase an old passport. Some collectors acquire passports because the bearer was famous. Carrie Fisher’s passport is likely to be purchased by someone who collects Star Wars memorabilia or who is simply a fan of the actress. Other celebrity passports that have appeared on the auction market in recent years include passports issued to Marilyn Monroe, Whitney Houston, and Muhammed Ali. Other collectors are specifically interested in passports themselves. They may value them as historical documents. Old passports are tangible records of countries that no longer exist. The image you see here, with a 1984 visa to enter East Germany (the Deutschen Demokratischen Republik) is a great example. Just five years after this visa was issued, the Berlin Wall fell. There is no more East Germany, so this passport stamp marks the end of an era! Passport collectors may also simply be lovers of travel, who like to look through old passport books to see the many entry stamps and visas, the marks of a life well lived. Enter your email address to follow this blog and receive new posts and latest updates related to US Passports and Visa Services.